Happy Thanksgiving to all of you here on LaLD! It’s 3 AM here in California and I’m finding it hard to go to sleep, so I went and snapped some photos of one of my favorite diecast pieces in my collection. 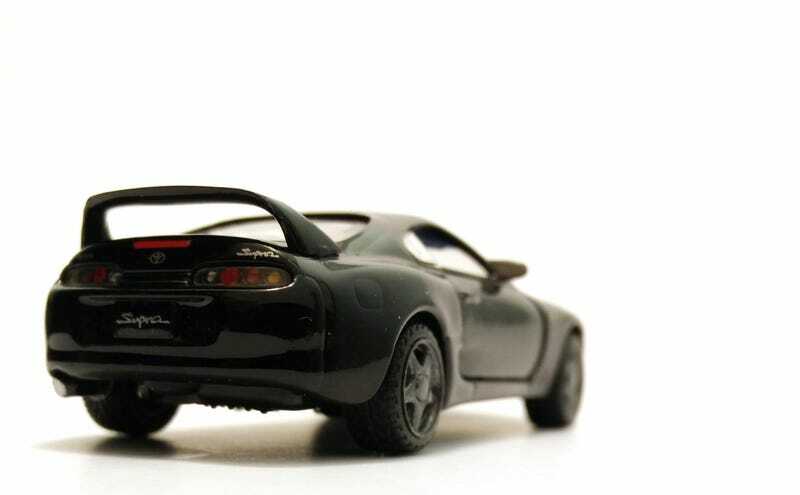 This is the Toyota Supra Mk.IV in 1/64 scale by Tamiya. Tamiya is known for its model kits, but it did make a few 1/64 diecast models as well. From what I know, this Supra was a part of a series of six 1/64’s, which includes the R32, R34, 350Z, S2000, and Miata. I have the R32 and 350Z, which I’ll show at a later date, but the Supra is the one which I think is the most precious. It’s hard to find a good 1/64 Mk.IV Supra these days. The HW one is trash (IMO, sorry to those who disagree) and while the MBX one is decent, it hasn’t been released in ages and is quite oversized. I don’t recall seeing Kyosho do one yet, and Tomica doesn’t have a “premium” version of this car. These Tamiya models have plastic lights, opening doors, proper wheels, and rubber tires. What I love about this one are the details on the taillights. It’s perhaps the most iconic feature of this generation Supra, and Tamiya has done it well, with each bulb painted a different color then overlayed with the plastic cover. If there’s one flaw, it’s the exhaust, which is painted on and looks rather cheap in comparison with everything else. But that’s just me nitpicking.